It’s no secret Indian Ringneck parrots, also known as Rose-ringed Parakeets, are exotic creatures. In fact, just looking at these birds, you can’t help but be drawn in by their appearance. These birds have a hooked beak, a long tail, and are roughly 16 inches in length. Typical wild Indian Ringnecks are green with undertones of blue that can be seen during overcast days. These parrots have yellow feathers showcased under their wings and tail when fanned open. Both males and females look very similar; however, the male has a black ring around his neck. This ring is highlighted with turquoise, pink, and blue. Although the female may not exhibit this impressive ring, many Indian Ringneck enthusiasts will argue a slight green ring is visible. The male and female both have large tails that are comprised of 12 feathers. The two largest tail feathers, which are blue, make up a large part of the parrot’s size. These elaborate tails can extend as much as 7 inches outward for the male and 6 inches outward for the female. Because these parrots are mostly green, they are very difficult to see during roosting or when perching in trees. Most of the time, the presence of these parrots can be given away through their contact calls. Indian Ringnecks are native to Asia and Africa and can be seen in the forests or arid environments. It’s not uncommon to see them thrive in urban areas as well. They have established colonies in environments which are not native to them, some significant points of interest include California, Florida, and the UK. These birds are believed to cause major damage to crops; however, little evidence has been published to prove this accusation. Rose-Ringed Parakeets can be seen in rural areas feeding on bird feeders or relaxing in parks. Like most parrots, Indian Ringnecks are intelligent and DO make great pets. They learn concepts quickly and love to show off. Along with being intelligent, they are great at talking. Quaker Parakeets are known for their talking ability, but a Ringneck can speak with clarity that is phenomenal. These birds are indeed masters at talking for their size and can easily compete with Quakers, African Greys, and Amazons. 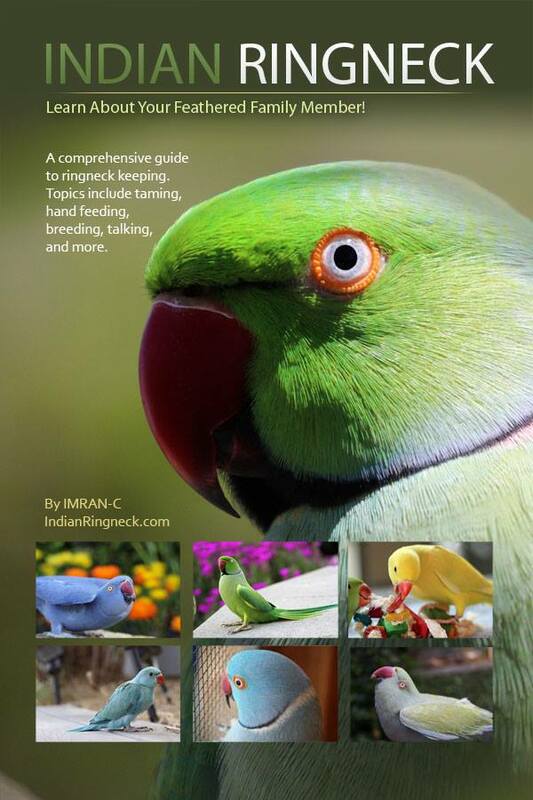 With that being said, I have decided to start an Indian Ringneck site that is devoted to these majestic parrots.